Let’s talk about fender beading in regards to the ’67 Beetle. Over years of wear and tear, the correct fender beading is often times replaced with the common black version. However, you may not be aware that 1967 was a very innovative year for Volkswagen. A deluxe ’67 Beetle would originally be fitted with fender beading to match the body paint color. 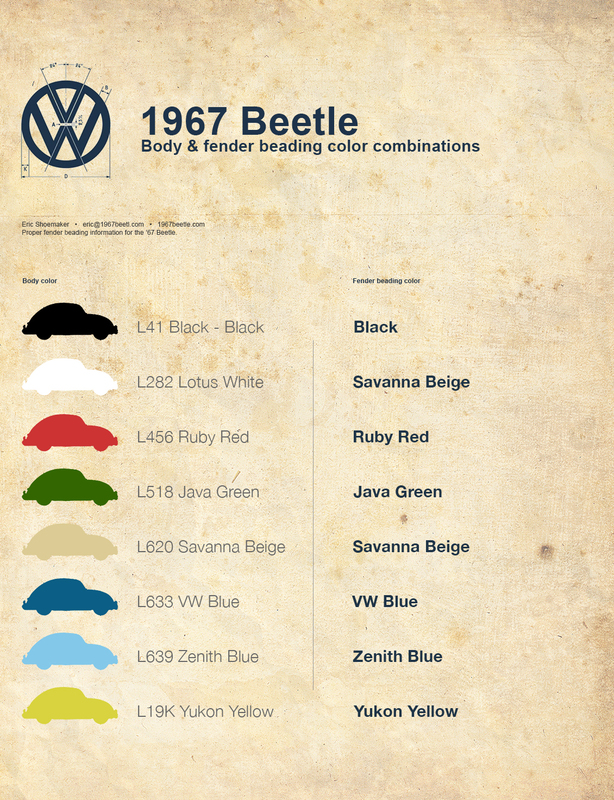 In the event you’re looking to bring your ’67 Beetle back to its former glory, I’ve provided the correct color combinations, as well as a chart illustrating the information. You can download below. Note: Colored fender beading was only installed onto deluxe and convertible models, standard models (hardtop and sunroof) were equipped with black fender beading, regardless of the exterior paint scheme. You taught me something about the beading Eric. I didn’t know there was a difference between the standard and deluxe beading. My Lotus White did come with Savanna Beige. I saw a 67 Air Cleaner on The Samba this morning for $10. Looks to be in good shape, just needs restoring. Thanks for reading. Oh? Email me and I’ll take a look. Forgive my ignorance on the subject (relatively new ’67 owner) but what is the difference in ‘deluxe” and “standard”? Thanks again for an informative article!! I’ll let Jay chime in. I see the small descript for a bus but….not for a Beetle. Thanks for your time anyway! Found it on another website. I guess all US Beetles are “Deluxe”. 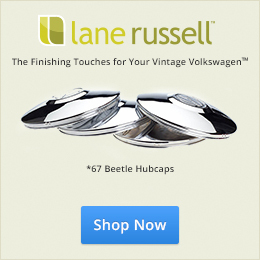 …..The Standard Beetle was a “stripped down” model of the Beetle without almost any body or window chrome trim. In fact, the door handles, hood handles and front turn signal housings were painted, usually in grey. These were sold primarily in Europe, but available in other markets such as Canada. The Deluxe Beetle is what was primarily sold in the United States with the familiar body and window chrome moldings, door and hood handles and chromed front turn signal housings. Hello, again, Anthony…After some talk amongst ourselves, I believe that the consensus is that 1967 Beetles which came from the factory directly for USA consumption were “Deluxe” models. However, Standard models have come into the USA via private importation from Canada and Europe, mainly, but also from other sources not directly destined for USA consumption. These generally are pretty scarce these days–although one will turn up now and then. Nowadays when a person in the USA speaks of a “Standard” Beetle, he usually means that the car is not a SuperBeetle. No talk of Super Beetles around here! Eventually I’ll get the zenith blue beading. I know I better not wait too long. What’s harder to get? Fender beading or running board mats? Hmmm…. Both, actually! Zenith Blue fender beading is next to impossible. 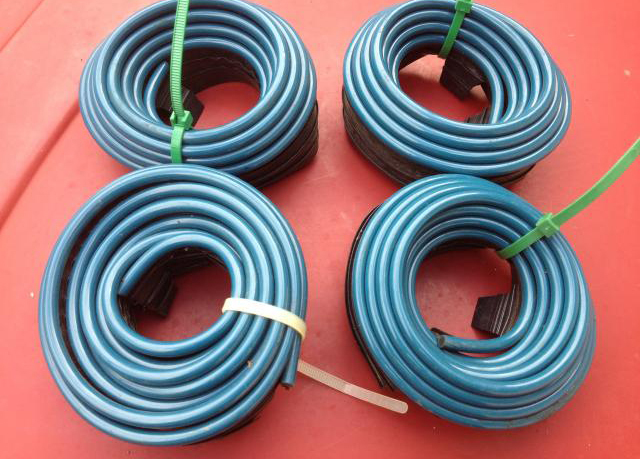 I am looking for L633 VW Blue beading and I am also having a difficult time. Yes, NOS might be the only way. A source might be taking a trip to Germany, and digging in all the long and forgotten places VW once made these great cars. Honestly, some pops up now and then on the web, but it’s few and far between. What color do you need? Excellent information! It has always been a bit Of a mystery to me what the correct color combination should be. On my sea blue 66 sedan I use the black beading. I have some, but let me see how much. It’s the subtle details that make the car look fantastic. Hey, back. A bit odd as I’ve seen Zenith Blue running boards. Any chance your car had work done prior? I’ve found recently that you have to dye the beading to get the correct color now that the original is not offered anymore, unless you’re fortunate to findNOS. Wolfsburg West offers info on products used to dye the beading. I recently had repairs done to my Lotus White 67. Rather than dye the new beading, I had an upholsterer cover my original with a material that’s not Savannah Beige, but close. I’ll try to get some pics. The dyeing process is simply painting the bead. Ryan, that’s great info. Although I did what I mentioned in my previous post, I would love to find the correct beading without having to paint/dye. We may actually offer the correct fender beading in the future. We’re looking into it. I tried to post a link but the site won’t let me. Probably thinks it’s spam? And while we are talking about obscure color combinations: Does anyone out there know if the front windshield heater tubes (made with paper and aluminum) were painted with the body at the factory or added at a later date. Some sedans have black uncolored look and others have the same color as body. I suspect the later because it looks as though it would be impossible to correctly fit the hoses in the space between the fender well and body. “Here’s the link to the German website that sells colored fender bead. It appears they don’t ship to the USA. My two sets, along with my NOS running board mats were delivered to me via a friend in Berlin so I have no experience in dealing directly with this webstore. Looks like I will be having to install Savannah Beige fender beading when I eventually repaint my car to its original Lotus White color. Sorry Eric….didn’t mean to start an all out town hall meeting! Good info though…..I was confused because EVERYTHING on mine except the carb (found original numbers correct core on EBay) is original. That beige beading had me shaky. Thought it might be aftermarket from years ago. BTW…..How is the SE treating you two Eric? No worries! That’s what we are here for. We are doing well. Just trying to grow our business. http://lanerussell.com. Hey that’s awesome….I’m CAPT. Doofus. I didn’t correlate that that was your outfit! Do you have a FB presence? There are many 67 owners I come in contact with thru FB. I’m currently looking for a Sapphire V radio….can you believe someone liberated it from a show in TN??! I’m over here in Birmingham AL….a few bucks in petro away. Eric, is it impossible to find? Looks like someone has a set posted in the Forum. Does anyone know where I can find Savanna Beige beading or running board covers?